Because I’m still having image transfer problems and I have a hell of a headache so I’m not even trying to fix it tonight. Except she doesn’t because of “low memory”. Stupid phone. I give up. Okay . Still have technical issues with phone posts, which is why no posts since Friday, as I was in Boston doing awesome things with the Docstar and then spent two days designing and sewing a Ponce de Leon costume. Like you do. Test Baby, Test Baby, 123! This is a post from my phone, though not from the app as that turned out to be not only not working but crashing the whole blog. Oops. So I’m trying to post from the browser on my phone, which is kludgy interface-wise but potentially functional. I did say there would be cat pics. That super seekrit project I posted the other day? It’s for work and I have to finish it by the 12th. Which puts me back where I was last time I tried this, with unidentifiable pics of a thing I can’t talk about. Bo-ring. So I’m going to push this off to the 15th(ish). This was supposed to go up yesterday, but I encountered some technical difficulties. Better late than never. 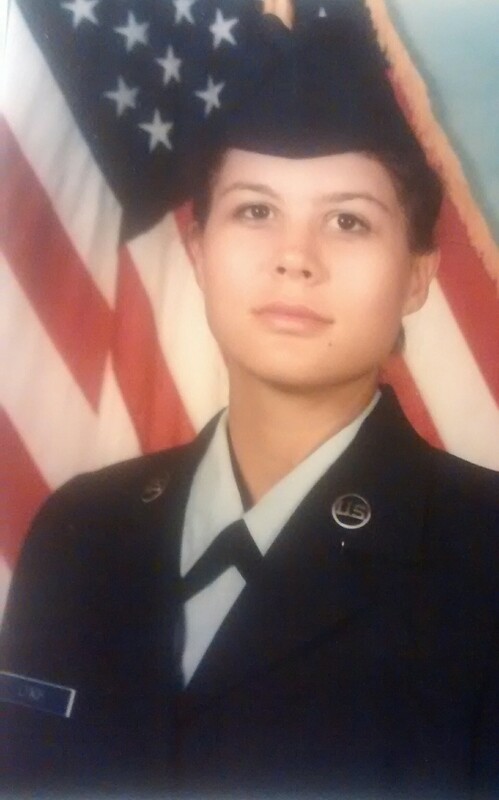 My basic training photo, September 1992. As of Thanksgiving this year, I will have been a U.S. Air Force veteran for 20 years. Which makes me feel old, but also makes me realize how many years I have been dealing with conflicting feelings about my service. I entered the Air Force at the tail end of the first Gulf War and during my enlistment did a very brief stint in the sandbox (Dhahran, Christmas ’93, during Operation Southern Watch) which makes me a third-generation* war veteran. I hope it ends with me. It wasn’t until a few years ago that I felt able to celebrate Veteran’s Day, or announce with some amount of pride that I was a veteran. It wasn’t that I was ashamed of my service: I served honorably and have the discharge to prove it. It was that I felt more like a survivor than someone who had served her country. Every time someone thanks veterans for their service — whether it’s an individual thanking me personally, an individual making a blanket statement thanking all vets, or a company offering freebies/discounts to vets in appreciation of our service — it reminds me that I didn’t just survive the experience, I served my country. So on this Veteran’s Day, I thank all of you for recognizing and honoring our service. It means more than you can know. *At least third generation — I’m unaware of whether my great-grandfathers served or not. My father served in Vietnam and both grandfathers served in WWII and were career military. All of us were USAF. Well, technically my grandfathers started out Army Air Force, but both stayed in and were eventually USAF. **Not even necessarily traumatic events…just thinking about day-to-day things or funny anecdotes can trigger strings of thoughts and feelings that send me into a stress/depression spiral. When I went to the VA last year, it was so stressful just being in a place that is related to the military that my blood pressure, which is normally around 120/70, jumped up to 190/150.